A couple weeks ago, I had the privilege and honor to play one of the most prestigious golf courses in the Triangle. North Ridge is a private course and one that I have been wanting to play for several years. Thanks to a neighbor who recently joined the club, I had the opportunity to play this wonderful course. We played the Oaks course which was challenging, but fair for all golfers. I actually had a pretty good round, shooting 95, but I must preface my performance a bit. I did play from the Seniors’ tees since I was playing with three seniors so it reduced the yardage considerably. Nonetheless, I shot 95 on a course I had never played. The two courses include the Lakes and the Oaks, both designed by Gene Hamm and George Cobb. Each course was later re-designed by John LaFoy. This re-designed was to ensure that both courses played fair for all levels of competition. The courses, spread out over 400 acres in North Raleigh, offers very picturesque views and several amazing water holes. I am always drawn to Par 3s with water and the Oaks had two such holes. Both holes required you to carry the water with very limited area for error without being wet. I personally carried both water holes, landing on each green. One, I had a little too much juice which left me a long putt with most of it downhill. Unfortunately, I was too concerned with going beyond the hole that I came up short and ended up with a very rare 4-putt double bogey. The other one, I was pin high with a fairly level putt. I finished that hole with a par. In addition to thèse Par 3s on the front nine, the ninth hole offered a deceiving Par 4 with the green protected by a pond. It was deceptive in that the distance to the water appeared much less than it actually was. Thus, I used a iron to get into the fairway, which I was not successful and pulled it left, leaving nearly 200 yards over the water to the green. I got over the water, but again was left and missed the green with a chip shot to the green. The next time, I will use a fairway wood off the tee and aim right where there is plenty of grass for landing without having to worry about the water. It would also give a straight shot over the water onto the green. It may result is a bit longer shot, but a safer shot. I enjoyed this course and am looking forward to playing it again this year as the Downtown Links have arranged to have an outing at this course. With more knowledge of this course, I should be able to play a better round and take full advantage of this experience. Of course, there is the possibility that we will be playing the Lakes course, which would be fine with me as I would love to experience this course as well. North Ridge Country Club is a private club that offers many benefits for its members. Coupled with the golf, it offers a pool, tennis and a fitness center. The fitness center offers personal training tailored to the member’s needs. They offer specialized training for golf or tennis fitness as well as group fitness programs such as water aerobics, Pilates and yoga. The tennis offers junior programs, private lessons, clinics, mixers and tournaments. As a tennis player, I can appreciate good instruction in this area. The Olympic size pool offers a great way to spend warm summer days. With large decks, pool houses, kiddie pool and covered patio, this is a great place to relax. Just steps from the clubhouse, tennis complex and the 1st tee for the Lakes course, it is a great meeting place for members. Additionally, they have several activities for the youth to enhance their experience with the club. 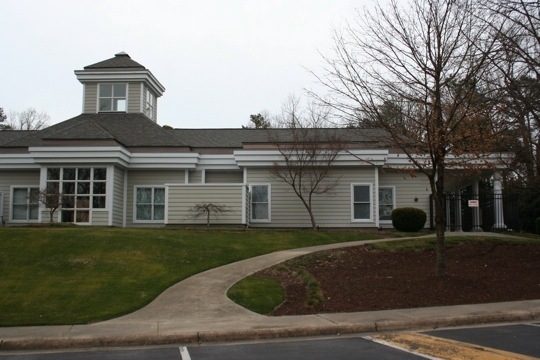 The clubhouse offers a wonderful dining facility that offers breakfast/Sunday Brunch, lunch and dinner. Membership is modest for what you get. There is an initiation fee and monthly dues with a food minimum. They offer several levels of memberships to suit your needs from Class A to Junior Memberships to Sports memberships and even a trial membership to get to know the club and see if it will be a good fit for you and your family. Prices vary depending on the level of membership and you can contact them through their website for additional information. The community is the gem in North Raleigh and is centered around the North Ridge Country Club. The club was founded in 1967 and homes began appearing soon thereafter. The community is a virtual who’s who of Raleigh business and community leaders. It has become the place to live in North Raleigh with homes ranging from the low $400,000 to well over a million and more. The community offers tons of sidewalks for leisure strolls in the evenings. Conveniently located, it is just a short drive to downtown, I-540 and RTP. Situated off Falls of Neuse Road, it is prime real estate. Buying in North Ridge, you typically have your choice from traditional to contemporary style homes, many with golf course lots. The community offers townhouses as well as single family homes. With this variety, you will be certain to find what you are looking to purchase in this community. When my wife and I first started looking for a home, we were very interested in this community and looked at everything available at the time. One of the homes we viewed was the home of the producers of the “Golden Girls”. After looking at all of these homes, we decided to purchase a town home not in North Ridge, but hope to one day call this community home. You are currently browsing the Back Nine Homes blog archives for March, 2012.